There are typically two types of hybrids. Ones that look and play like smaller sized fairway woods and those that are designed to look and play like irons. The Ping i25 hybrid is certainly the latter. 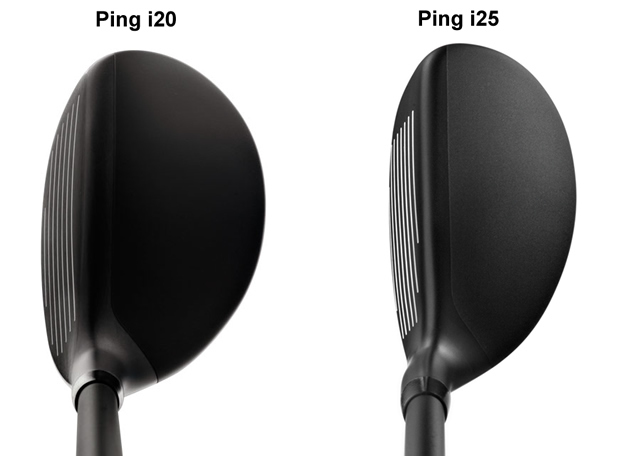 Ping have compressed the size of the head making it straighter, flatter and more compact for players that want their hybrids to play more like irons than fairway woods. Several tweaks and alterations were made to the profile of the head. The bulge and roll that transitions from the face to the crown has been minimized, the leading edge of the club is now straighter and the toe has been squared off. Ping say these changes allow the i25 to look more like an iron whilst also promoting better alignment and accuracy. You can really see the changes in the image below, compared to the previous i20 hybrid launched early in 2012. The head is narrower and also shorter in heel to toe length. Ping say this profile shape allows the i25 hybrid to interact with the turf more efficiently. You might also notice a slight change in the way the shaft and hosel merge with the clubhead. More than just an offset, Ping have moved the hosel forward which they claim the new position helps launch the ball higher with less spin. To offset the new hosel alignment, Ping pushed the centre of gravity in the i25 hybrid deeper and further back in the head. 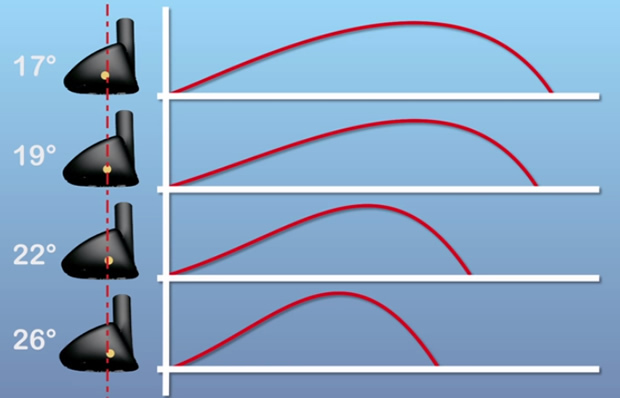 On the lower lofted models, the CG is further back ensuring players get the ball up in the air, whilst the higher lofted hybrids feature a more-forward CG that keeps the ball from spinning too much when launched higher. Where the i20 hybrid was available in only 17, 20 or 23-degree options, the i25 squeezes a fourth option into the range by offering lofts of 17, 19, 22 and 26 degrees, giving players more options and an additional replacement for their 5 iron. As with the i25 driver and fairway woods, the hybrids benefit from Ping's new in-house PWR shafts. The PWR (Power, Weighting, Responsiveness) shafts are designed to maintain same D1 swingweight regardless of the weight or flex in the shaft.